The end of September marked the grape harvest and the start of the wine-making season. Once made, the grape juice is left to age for all different lengths of time, depending on the varietal. However, November 11, or Saint Martin’s Day, marks the first tasting of the new wine, also known as “novello.” In towns like Fornazzo, a fraction of the larger community of Milo (Catania Province), which is on the eastern slopes of Etna, they celebrate la sagra di San Martino by making fresh maccheroni, sauteing greens from the countryside, and grilling up the best local sausage–all to be eaten as they taste the new wine from Etna. Homemade cakes, fresh ricotta cannoli, and roasted chestnuts are also enjoyed. Milo is on the east coast of Sicily, while on the west coast, where sweet, fortified wine such as Marsala and Moscato are king, the tradition is to taste the new wine with hard, round, anisette biscotto. 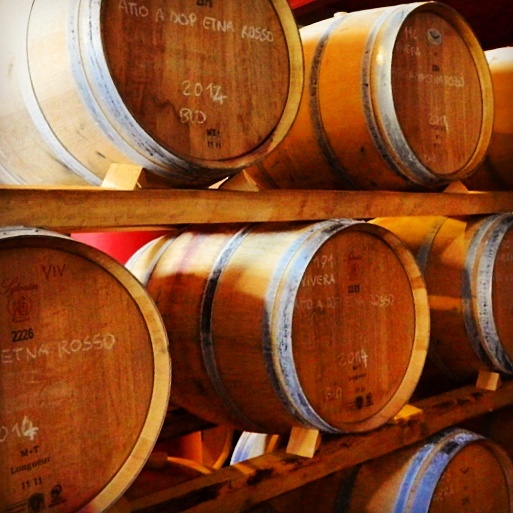 The barrels pictured are from the cantina of Vivera Winery, also on the slopes of Mount Etna. The description of the food got me – everything sounds so good! Love the photo of the barrels – warm colors.